A pious man once said: “I suffered some hardships, worries and sorrow, and I left my home disoriented without a goal. I went on the road leading to Makka without provisions or a ride. I walked three days, and on the fourth day, I felt extremely thirsty and tired, I got scared for myself, and I did not find even a tree to sit under its shade, or even a drop of water to drink. I sat facing the Ka’ba awaiting death. While sitting there, my eyes were overcome with drowsiness and I fell asleep. I saw someone in my sleep; he reached out and shook hand with me. I said to him: “May Allah show you His Mercy, who are you?” He replied: “I am Khidhir”. I said: “Pray to Allah for me”. He replied: “Say three times: “O Kind with His creation, Who knows the conditions of His creation, and Who is well acquainted with His creation, Show me Your Compassion, O Kind One, All-Knowing Lord Who is well acquainted with all“. I immediately said what the Khidhir told me, and he further continued, “This is a treasure gifted to you. 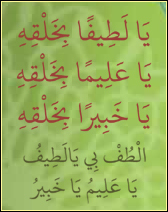 Repeat it frequently, it stops your worries and abates your anguish, and with this prayer you will meet with all your needs in this life and in the next. If you ever experience hardships or be struck with unfavorable conditions, say this prayer, it will satisfy any condition, cure your ailment and bring you happiness”. He then disappeared from my sight. I woke up repeating this prayer. Allah is my witness, whenever I experienced difficulty or hardship, I invoke this prayer, and Allah SwT brings me the needed relief and shows me of His Holy Kindness what my tongue cannot describe”. ذَكَرَ أَحَدُ الصَّالِحِينَ : أَدْرَكَتْنِي ضَائِقَةٌ شَدِيدَةٌ وَهُمُومٌ وَأَحْزَانٌ، فَخَرَجْتُ هَائِمًا عَلَى وَجْهِي وَسَلَكْتُ طَرِيقَ مَكَّةَ، بِلَا زَادٍ وَلَا رَاحِلَةٍ فَمَشِيتُ ثَلَاثَةَ أَيَّامٍ، فَلَمَّا كَانَ الْيَوْمَ الرَّابِعَ إِشْتَدَّ بِي الْعَطَشُ وَالتَّعَبُ، فَخِفْتُ عَلَى نَفْسِي الْهَلَاكَ، وَلَمْ أَجِدَ حَوْلِي شَجَرَةً أَسْتَظِلُّ بِهَا أَوْ قَطْرَةَ مَاءٍ، فَجَلَسْتُ مُسْتَقْبِلًا الْقِبْلَةَ مُنْتَظِراً الْمَوْتَ، فَغَلَبَتْنِي عَيْنَايَ وَأَنَا جَالِسٌ، فَرَأَيْتُ شَخْصًا فِي الْمَنَامِ فَمَدَّ يَدَهُ إِلَيَّ وَصَافَحَنِي، وَقَالَ: أَبْشِرْ فَإِنَّكَ تَسْلَمُ وَتَزُورُ بَيْتَ اللهِ الْحَرَام، وَتَزُورُ قَبْرَ النَّبيِّ صَلَّى اللهُ عَلَيْهِ وَسَلَّمِ، فَقُلْتُ لَهُ: مَنْ أَنْتَ يَرْحَمُكَ اللهُ ؟ قَالَ: “أَنَا الْخِضْرُ” فَقُلْتُ: “اُدْعُ اللهَ لِي” فَقَالَ لِي قُل: “يَا لَطِيفًا بِخَلْقِهِ، يَا عَلِيمًا بِخَلقِهِ، يَا خَبِيرًا بِخَلقِهِ، أُلْطُفْ بِي يَا لَطِيفُ يَا عَلِيمُ يَا خَبِيرُ” ثَلَاثَ مَرَّاتٍ، فَقُلْتُهَا فَقَالَ لِي: هَٰذِهِ تُحْفَةٌ لَكَ، رَدَّدْهَا تَكْفِي هَمَّكَ، وَيُزَالُ كَرْبُكَ، وَبِهَا غِنَّى الدُّنْيَا وَالْآخِرَة، فَإِذَا لَحِقَكَ ضَائِقَةٌ، أَوْ نَزَلَتْ بِكَ شِدَّةٌ، قُلْهَا تَكْفِي وَتَشْفِي وَتُسْعِدُ، ثُمَّ غَابَ عَنِّي، فَاسْتَيْقَظْتُ وَأَنَا أَقُولُهَا، فَوَاللهِ مَا قُلْتُهَا عِنْدَ كُلَّ ضَائِقَةٍ وَ شِدَّةٍ إِلَّا وَرَأَيْتُ مِنْ فَرَجِ اللهِ وَلُطْفِهِ بِي مَا يَعْجِزُ لِسَانِي عَنْ وَصْفِهِ.